With the rise of e-mail and cell phones, it's easy to forget that many kids have never sent a letter. 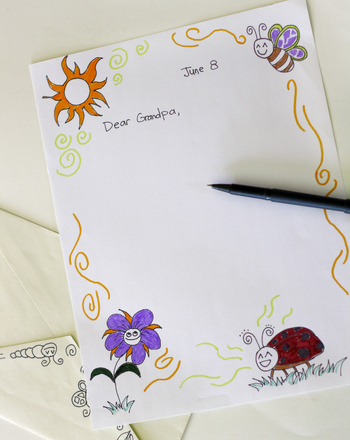 Motivate your child to write a special letter by helping him create a beautiful, handmade piece of stationery. Letters are a great way for him to keep in touch with loved ones and practise his writing! If your child isn’t sure how to write one, this easy project will lay out step-by-step guidelines that are easy to follow. Give your child a piece of thick paper, and have him decorate the paper with a border and small drawings. Good choices are flowers, suns and moons, racecars, or simple geometric designs. If he'd like, he can decorate the back of the envelope with matching designs around the border or on the flap. Make sure that he leaves plenty of blank space for the address, return address, and stamp on the front! When your child has finished decorating, help him choose a letter recipient and brainstorm ideas of what he may want to say to that person. Show him how to write a salutation and the date at the top of the letter, and let him fill the letter with his thoughts. After he finishes and signs the letter, give him the envelope and show him where to write the recipient’s address. Explain where the return address goes and have him write that out as well. Finally, help your child finish by sealing the letter and placing a stamp in the corner. Help him raise the red flag on the mailbox, and explain what that indicates to the mail carrier. Teaching your child how to write a proper letter and why it’s important to keep in touch with friends and relatives will help him develop these habits early. Letter-writing is the foundation of thank-you notes, good communication, and even e-mails, so encourage your child to keep writing!